Margaret “Mag” Johnson, 83, of Union, Iowa, passed away on Monday, July 2, 2018, in the comfort of her own home. Funeral services for Margaret will be held at 10:00 a.m. on Saturday, July 7, 2018, at the Church of Christ in Union, Iowa, with Pastor Rick Schill officiating. Public visitation will be held from 5:00 – 7:00 p.m. on Friday, July 6, 2018, also at the Church of Christ, where family will be present to greet friends. Memorial contributions may be directed in Margaret’s name to her family. For further information or to send a condolence please visit www.mitchellfh.com or call (641) 844-1234. Mitchell Family Funeral Home is caring for Margaret and her family. Margaret Jessup was born on June 22, 1935, in Marshalltown, Iowa, the daughter of Clifford and Gail (DeWitt) Jessup. She graduated from Union High School. Following high school, Margaret went to the Iowa State Teachers College for one year. On November 6, 1954, she was united in marriage to Bob Johnson in Clemons, Iowa. From this union four children were born: Kim, Pat, Jan and Kipp. Margaret was retired from the South Hardin Recreational Area after 24 years as manager. She was a proud member of the Red Hat Ladies and Die Hard Cubs Fan Club. 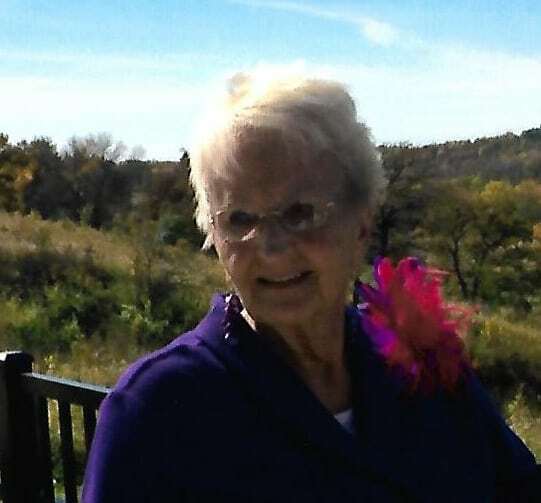 Margaret had a passion for collecting stuff, watching all sports, whether it was watching the Chicago Cubs, Iowa Hawkeyes or Iowa State. She also played all four years on her high school varsity basketball team, where she made Honorable Mention and All-State. Margaret even played for the Gasoline Alley Basketball AAU team following high school. Her biggest passion in life was her family and being together with her love, Bob. Left to cherish her memory is her loving husband, Bob; children: Kim (Judy) Johnson, Pat Johnson, Jan (Sharon) Johnson and Kipp (Jana) Johnson; grandchildren: Britni (Ryan) Morgan, Jamey (Allyson Joslin) Johnson, Casey (Travis) Austin, Sydney Johnson and Carson Johnson; great-grandchildren: Clara Morgan, Henry Morgan and Everett Austin; one brother: Stephen (Sandra) Jessup; as well as many nieces and nephews. She is preceded in death by her parents, Clifford and Gail.